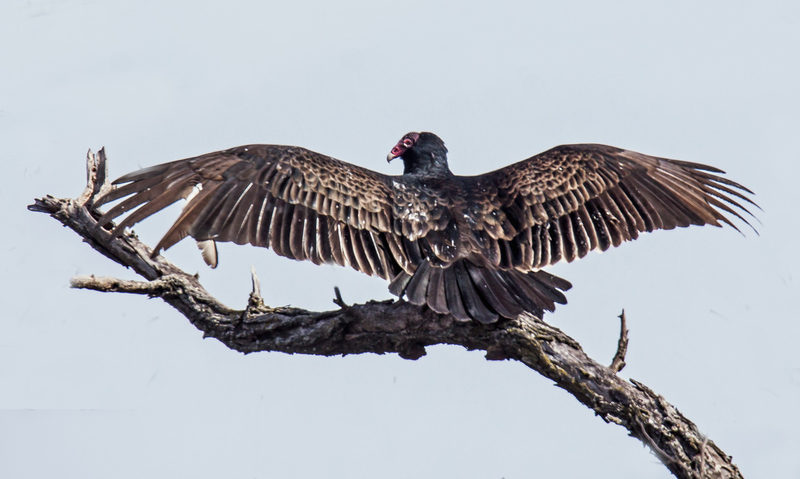 I wouldn’t exactly say that this Turkey Vulture (Cathartes aura) was handsome, but you have to admit that it has an impressive wingspan display. I spotted this vulture earlier this week at Occoquan Bay National Wildlife Refuge. Its spread wing position reminded me of a cormorant, which pens its wings like that to dry them out. I have no idea why the vulture felt the need to do so, but it held its wings open for an extended period of time. Thanks, Liz. I was intrigued by the bent wing on the left side and wonder how that happened. the feather? I looked at it and wondered.. about whether a new feather will grow in its place. Great capture of this magnificent bird, Mike. Yes, their heads aren’t that pretty, but this back view shows his good side and the dead branch is a perfect perch. I’ve seen them stand with wings spread and wonder if it is to absorb heat from the sun—assuming it was cold up your way that day! Thanks, Ellen. It was sunny, but cool that day. As I recall, it was in the low to mid-40’s.